Dragonfly Sweetnest: A Mask Like No Other! A Mask Like No Other! Don’t let these fall cold months dull your skin. 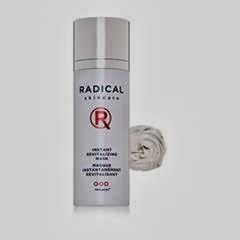 Thanks to Radical Skincare, created by two sisters on a mission, Liz and Rachel Edlich your skin never has to look or feel dull again. This intelligent Instant Revitalizing Mask is based on Trylacel technology and knows where your skin needs the most work. It bubbles where your skin has trouble, infusing powerful actives and vitamins to enhance skin performance. Now what other mask do you know does that? This wonderful easy to use mask will hydrate and nourish hungry skin with vitamins and oxygen, leaving your skin smooth and glowing within in minutes.